The research in Professor Turner's group focuses on the forces directing nucleic acid chemistry, with particular emphasis on RNA folding. This chemistry is important for life and for design of therapeutics. Nevertheless, much of it is not well understood. Studies of the properties of short oligonucleotides and related computational studies provide insight into the interactions determining the sequence dependence of the structures, energetics, and dynamics of nucleic acids. Insight into the structures of large RNAs are provided by experiments that provide: (1) NMR spectra and (2) chemical reactivity of individual nucleotides. This information is incorporated into computer programs to predict the secondary and three-dimensional structure of an RNA. The results from these studies are providing the foundation for a bioinformatics approach to develop deeper interpretations of the many nucleic acid sequences determined by the Human Genome Project and other sequencing efforts. Binding of RNA to oligonucleotides in a microarray is providing information to facilitate design of therapeutics to target RNA. The solutions to these challenging problems require many different clues. The group therefore applies the methods of UV and NMR spectroscopies, thermodynamics, computational chemistry, oligonucleotide synthesis, chemical and microarray mapping of RNA structure, and rapid reaction kinetics. By combining the results obtained from these various techniques, it is often possible to deduce unifying concepts for the nucleic acid chemistry. 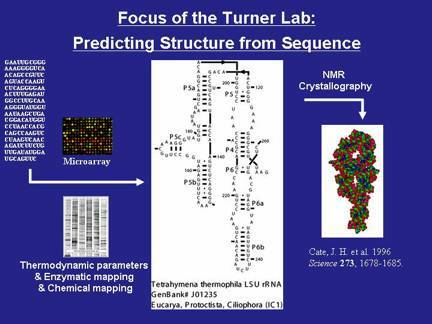 The goal of the Turner group is to predict RNA secondary and 3D structure from sequence. E. Lenartowicz, A. Nogales, E. Kierzek, R. Kierzek, L. Martinez-Sobrido, and D. H. Turner "Antisense Oligonucleotides Targeting Influenza A Segment 8 Genomic RNA Inhibit Viral Replication," Nucleic Acid Therapeutics 2016, 26, 277-285. E. Lenartowicz, J. Kesy, A. Ruszkowska, M. Soszynska-Jozwiak, P. Michalak, W. N. Moss, D. H. Turner, R. Kierzek, and E. Kierzek "Self-folding of Naked Segment 8 Genomic RNA of Influenza A Virus," PLoS ONE 2016, 11:e0148281. J.L. Chen, S.D. Kennedy, and D.H. Turner "Structural Features of a 3’ Splice Site in Influenza A," Biochemistry 2015, 54, 3269-6782. J. L. Chen, S. Bellaousov, J. D. Tubbs, S. D. Kennedy, M. J. Lopez, D. H. Mathews, and D. H. Turner "Nuclear Magnetic Resonance-Assisted Prediction of Secondary Structure for RNA: Incorporation of Direction-Dependent Chemical Shift Constraints," Biochemistry 2015, 54, 6769-6782. D.E. Condon, S.K. Kennedy, B.C. Mort, R. Kierzek, I. Yildirim, and D.H. Turner "Stacking in RNA: NMR of Four tetramers Benchmark Molecular Dynamics," J. Chem. Theory and Comput. 2015, 11, 2729-2742. D.H. Turner "Fundamental Interactions in RNA: Questions Answered and Remaining," Biopolymers 2013, 99, 1074-1104. Kennedy, S.D., Kierzek, R., Turner, D.H. "Novel Conformation of an RNA Structural Switch," Biochemistry 2012, 51, 9257-9259. Moss, W.N., Dela-Moss, L.I., Kierzek, E., Kierzek, R., Priore, S.F., Turner, D.H. "The 3' Splice Site of Influenza A Segment 7 mRNA Can Exist in Two Conformations: A Pseudoknot and a Hairpin," PLoS ONE 2012, 7(6), e38323. Chen, J.L., Dishler, A.L., Kennedy, S.D., Yildirim, I., Liu, B., Turner, D.H., Serra, M.J. "Testing the Nearest Neighbor Model for Canonical RNA Base Pairs: Revision of GU Parameters," Biochemistry 2012, 51, 3509-3522. Yildirium, I., Kennedy, S. D., Stern, H. A., Hart, J. M., Kierzek, R., Turner, D. H. "Revision of AMBER Torsional Parameters for RNA Improves Free Energy Predictions of Tetramer Duplexes with GC and iGiC Base Pairs," J. Chem. Theory, Comput. 2012, 8, 172-181.